Introduction of yoga as a subject in schools from classes VI to X for central government run school has been proposed by Minister for Human Resource Development, Smriti Irani. This recommendation has found support from the Delhi Government. Irani said that schools boards can work towards opting yoga as a subject with 80 percentage practicals during which students have to perform various asanas. She was inaugurating the first yoga conference organised by the Central Board of Secondary Education and releasing the NCERT prepared syllabus and course material for students. Over a 1,000 people attended the conference, including teachers, students, participants and other guests. As per the MHRD’s proposal, which according to Irani, has to be worked by the education boards like CBSE, all central government run schools like Kendriya Vidyalayas and Jawahar Navodaya Vidyalayas can introduce yoga as a subject from classes VI to X. The minister also informed that a training module on yoga would be established for teacher education programme as well. The aim is to produce a pool of trained teachers in yoga to meet the growing demand for them, she said, adding that a syllabus has been prepared for teachers -diploma, bachelors and masters in yoga education. Irani also said that a mobile app will be launched on July 17 where NCERT books from class I to XII can be downloaded free. 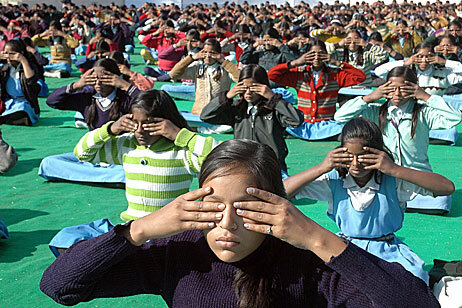 It may be mentioned that Madhya Pradesh, Maharashtra, Haryana, Rajasthan and Chhattisgarh had already introduced Yoga in their schools from this academic year.